A powerful, silent, and easy to use solution for Ethernet connectivity. 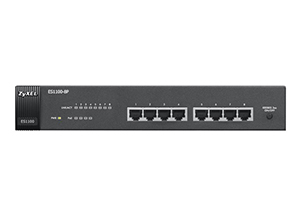 The Zyxel ES1100 Series 8/16/24-port FE Unmanaged Switch is designed for SMBs to boost business network performance and efficiency. The Series provides not only plug-and-play simplicity for high-bandwidth connectivity, but also N-way auto-negotiation to connect network counterparts with the highest possible data speed and to activate duplex mode automatically. The ES1100 Series is ideal for typical noise-sensitive office environments for its superior energy efficiency and Ethernet connectivity. 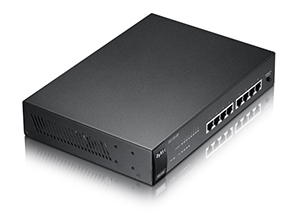 The Zyxel ES1100 Series consists of four Fast Ethernet switches and two Power over Ethernet (PoE) switches: the ES1100-16, ES1100-24, ES1100-24E, ES1100-24G, ES1100-8P and ES1100-16P. The desktop design of the ES1100-8P/16P/16/24E is ideal for SB or SOHO users seeking reliable network connectivity, while the ES1100-24/24G is designed for 19” racks, making it easy to be deployed in standard wiring closets. The environment-aware Zyxel ES1100 Series offers 10/100 Mbps Ethernet speeds that is critical to nextgeneration network applications. It also provides power-saving functions to reduce energy consumption for lowered operating costs. The IEEE Energy Efficient Ethernet (EEE) feature automatically detects network traffic and adjusts power consumption dynamically, enabling the switch to reduce power consumption during low link utilization periods. The inactive link detection function automatically reduces power usage when inactive links or devices are detected. The Zyxel ES1100 Series can adjust power consumption according to link status and the number of active network devices. 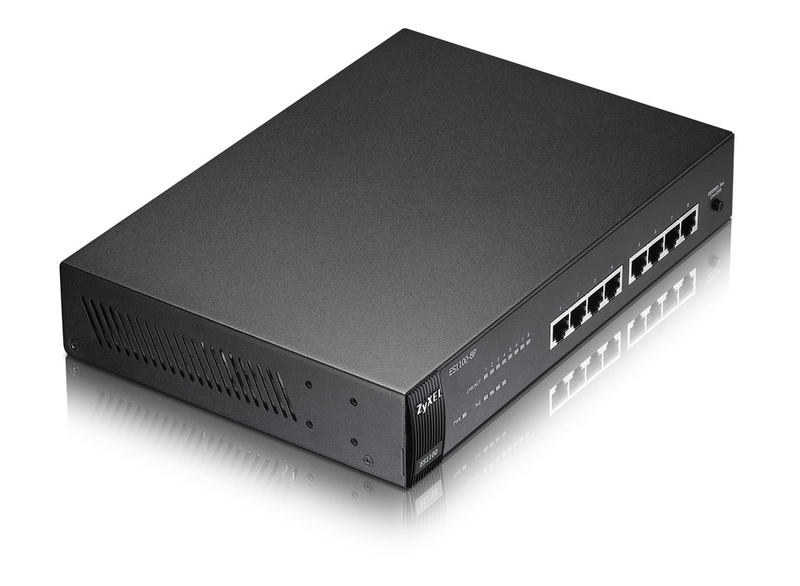 The Zyxel ES1100 Series comprises of unmanaged Fast Ethernet switches that provide an inexpensive solution for Fast Ethernet connections to the desktop with outstanding performance. The ES1100 Series is an ideal solution for bandwidth-intensive applications such as high-resolution photo delivery, video/audio streaming and downloading as well as server farm connections. 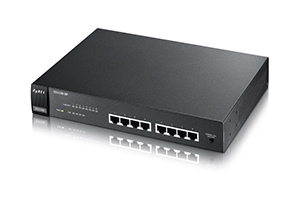 The full ES1100 range of Fast Ethernet switches have been designed to boost your network performance and efficiency. With N-way auto-negotiation, the ES1100 Series connects to network counterparts with the highest possible data speed and activates duplex mode automatically. Unlike shared 10/100 Mbps networks, dedicated bandwidth is provided by the Zyxel ES1100 Series to eliminate traffic congestion. With the duplex mode, the ES1100 Series can also double the effective bandwidth by enabling two-way communication. The store-and-forward service brings low latency and error-free packet delivery, while the plug-and-play and multiple network protocol compatibility of the ES1100 Series make installation and management easier and faster than ever. With embedded rackmount brackets, the desktop-size models not only fit in desktop environments, but also on racks easily. These models come with wallmount accessories that make it easy to install on the walls when necessary. 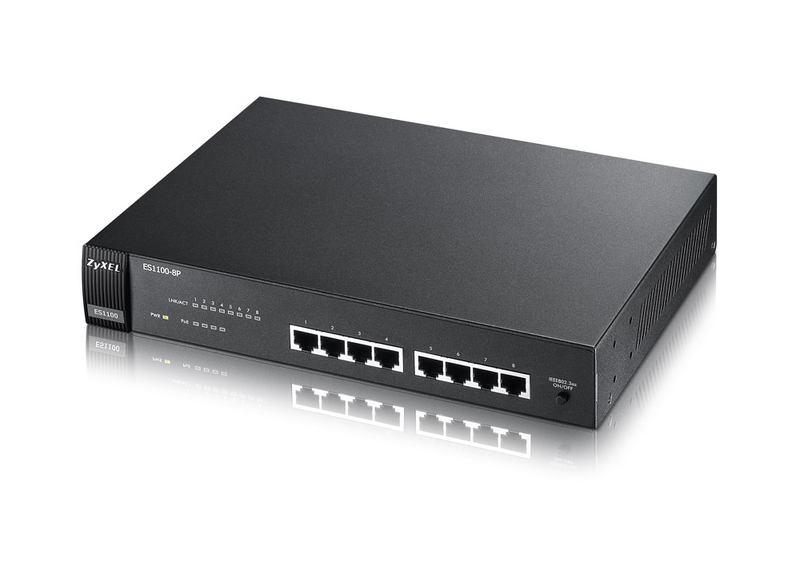 The Zyxel ES1100-8P and ES1100-16P support IEEE 802.3af PoE to ease the installation of network devices in challenging spaces such as ceilings or walls. 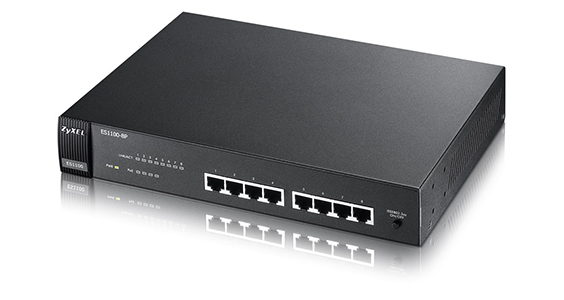 The power supply of up to 15.4 watts per port allows the ES1100 Series PoE switches to power PoE-enabled WLAN APs, VoIP phones and IP surveillance cameras through CAT-5 cables of less than 100 meters (300 feet) in length. With the ES1100 Series PoE switches, there is no need for extra power adapters in installing PoE devices in difficult locations. This feature helps enterprises reduce installation time and cost when there are many such devices on the network. Download the Zyxel ES1100-8P Datasheet (PDF).